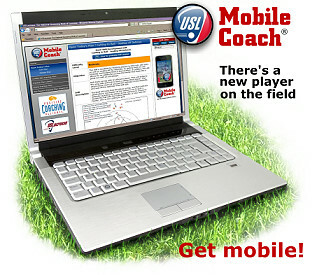 Coaches…below you will find information on the new US Lacrosse Mobile Coach App now available thru US Lacrosse. All coaches should have a practice plan so they van maximize their practice time efficiently and effectively. The US Lacrosse Mobile Coach app is now available and provides US Lacrosse coach members free access to 100 men’s and 100 women’s lacrosse drills, complete with explanations, diagrams and videos, all beamed to users of the iPhone and Android phone. The software, also available on computers via the web site www.uslmobilecoach.com, allows coaches to select, organize and install various drills illustrating dozens of lacrosse concepts for teams and players at the beginner, intermediate and advanced levels. The software, developed by US Lacrosse in conjunction with Advanced Mobile Solutions, is easy to use both online and on the smart phone. After a login screen, users can view and sort drills by gender, concept and skill level, and place them in order for a given practice. The material and concepts come from the highly successful US Lacrosse Coaching Education Program. (CEP), the first national, standardized training program for lacrosse coaches. "The new mobile technology allows coaches to easily access, organize and share US Lacrosse drills and video with players and assistant coaches on the field, "said Chris Snyder, manager of coaches' education and training at US Lacrosse. "This is a ground-breaking US Lacrosse member benefit for coaches at all levels." Got Questions or Need Help?Please email Chris Snyder at .